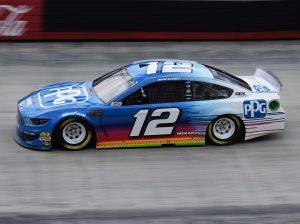 BRISTOL, Tenn. – Though they combined to lead 344 of 500 laps on Sunday at Bristol Motor Speedway, Team Penske’s three drivers all missed out on being able to celebrate in victory lane in the end. 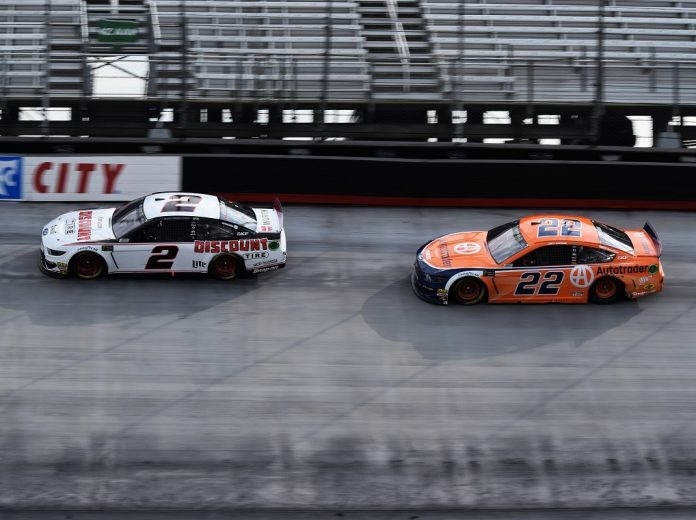 The Food City 500 was shaping up to be a Penske-perfect party, with all three cars running inside the top four for much of the day, but a late caution and subsequent strategy call became the trio’s undoing. Joey Logano, Ryan Blaney and Brad Keselowski all pitted for fresh tires after Kyle Larson smacked the wall to bring out the final caution with 22 laps left. In fact, Logano and Keselowski were first and second at the time. Not only did Keselowski’s No. 2 Ford jumble up the running order when the race resumed, it allowed eventual winner Kyle Busch and eventual runner-up Kurt Busch to escape, while Blaney and Logano tried to get out of the hornet’s nest of cars they were stuck in and give chase. Their efforts were all for naught, however, and none of the Roger Penske-owned Ford Mustangs ended up as the winner when the checkered flag waved. Logano ended up third, robbed of victory in a race where he led prior to the final caution flag and left wondering what might have been afterward. “Right at the end there I thought when we got by the (No.) 2 (of Keselowski) that it was the pass for the win,” said Logano, who took the lead with 31 to go. “I was pretty confident we were gonna be able to do that for 15 laps or so … and then the caution came out. What do you do? … You know a few of them are gonna stay out. By the time I got to third, those top two were so far ahead of me that I was stuck and was not going to get to them. Blaney, who finished fourth, was hoping to put the sour taste of last spring’s Bristol race behind him. He led a race-high 158 laps and appeared to be one of the favorites before getting mired in traffic late. “I need to get better as the track kind of rubbers out,” noted Blaney. “Joey is really good at it. I thought he had the best car, probably. The track rubbers in … and I just need to do something different there, but overall, this was not a bad day. We were up there all race and tried to keep up with the track. Then there was Keselowski, who ended up a lap down in 18th after having to make a pass down pit road during the final green-flag sprint to the finish. Keselowski had little good to say after climbing from his car, both about the restart and the penalty. That last sentence was an apt description to describe Team Penske’s entire end result at Bristol. It was a tough deal, indeed.